It marks the 50th anniversary of Mr Nagy's trial for treason for his role in the 1956 anti-Soviet uprising. The 52 hours of tapes began playing on Monday morning, and will continue in real time in a gallery in Budapest. 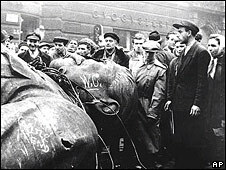 The 1956 revolution is seen by many Hungarians as one of the proudest moments in their history. It started on 9 June 1958 and lasted for a week. Mr Nagy, 62, was sentenced to death by hanging on 16 June 1958. The tapes will be broadcast at times corresponding exactly to the original trial. The idea of playing the tapes in public came from the 1956 Institute in Hungary and the Open Society Archives. They had been held under lock and key at the state archives but were relinquished after pressure from intellectuals. He added that even though the revolution was defeated, it dealt a blow to Soviet Communism from which many historians say it never recovered. 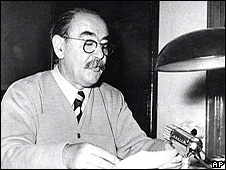 Imre Nagy and his colleagues were rehabilitated and reburied in 1989.